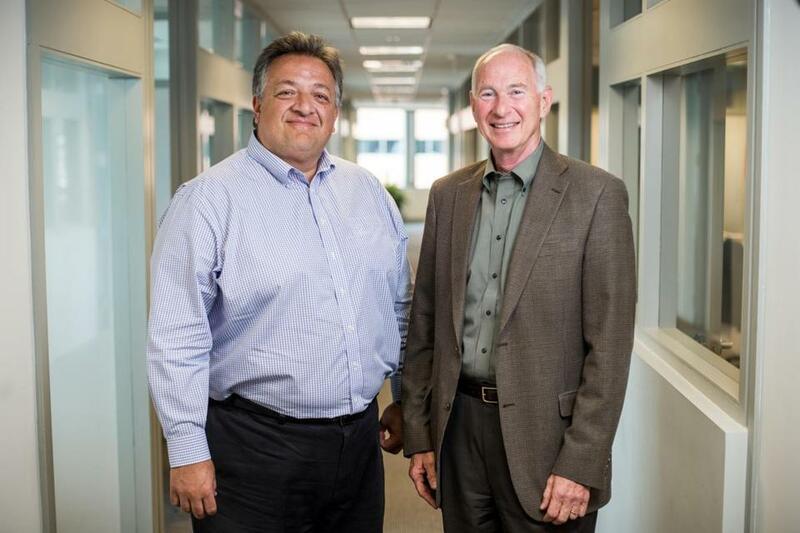 Flagship Pioneering CEO Noubar Afeyan (left) and the venture capital firm’s chief medical officer, Michael Rosenblatt. Flagship Pioneering, one of the state’s leading creators of life sciences firms, said Wednesday that it has raised $824 million in venture capital to bankroll startups, the Cambridge company’s largest-ever single fund-raising effort. The infusion of cash comes 15 months after Flagship announced a $618 million fund-raising round, its largest at the time. Since Flagship was founded in 2000, the venture capital firm has raised a total of $3.3 billion in eight funds to spawn and finance biotech, medical technology, and bio-agriculture businesses. Noubar Afeyan, founder and chief executive, said the latest fund will be reserved for companies that Flagship has already publicly launched but need more venture capital and private investments from outside sources before they can sell stock in an initial public offering. Moderna Therapeutics, a Flagship-created biotech in Cambridge that raised about $2 billion in at least eight rounds before the startup went public in December, is the type of company that would have gotten money from the new so-called special opportunities pool, Afeyan said. Such startups “have reached an inflection point” but need more venture capital from Flagship, and money from outside institutional investors, before they can sell stock. After going public, Moderna raised more than $600 million in biotech’s largest initial public offering ever. The offering valued the startup at roughly $7.5 billion. Moderna wants to use molecules called messenger RNA, or mRNA, to spur the human body to make its own medicines. The new pool of capital announced by Flagship will supplement a previous $285 million “special opportunities fund” that closed in 2016, Afeyan said. Flagship has also had six funds to finance startups right from the drawing board. Of the $3.3 billion that Flagship has raised since its founding, it has used more than $1.5 billion to create and grow startups. Outside investors have poured in another $10 billion. Those are huge sums, but if venture-backed biotech startups prove successful, investors could reap huge returns. Drug development and other life sciences endeavors are risky propositions, however, and many ventures fizzle out. Flagship has created more than 75 life sciences businesses, including four that have gone public since May. In addition to Moderna, they included Evelo Biosciences and Rubius Therapeutics, both in Cambridge, and Kaleido Biosciences, of Lexington. All but a handful of Flagship’s companies are based in Massachusetts, and most are in Cambridge or Boston. The companies employ about 3,500 workers and occupy approximately 1.3 million square feet of lab space, Afeyan said. Across Flagship’s portfolio of companies, 33 clinical trials were underway last year, in addition to more than 50 potential medicines in pre-clinical development. Flagship is hardly the only venture capital firm to raise significant sums in recent years to start and grow life sciences firms in Massachusetts. Boston-based Third Rock Ventures has raised $1.9 billion since 2007. Atlas Venture, of Cambridge, says it has invested more than $2 billion since 1990, including $880 million raised since 2015.